Twitter was founded in 2006 by Odeo (a podcasting company). It was first used as an internal service for Odeo employees, and later, it became public and then took off as its own company in 2007. Today, Twitter is ranked in the top 50 websites on Alexa, and in February 2009, a blog post by Compete ranked Twitter as the third most used social networking site. The original intention of Twitter was to announce to your friends and family, in 140 characters or less, what you were doing, as you were doing it. People would be updated all the time on the status of their friends. I know many of you are already all over Twitter and are already familiar with its benefits as a professional working designer. If you aren’t on Twitter yet, hopefully you’ll see why you need to join in the conversation and be a part of this social networking phenomenon. If you’re already on Twitter, I hope to share some tips with you that you may not have considered before. Here are 10 tips for using Twitter to help you network, find jobs, and/or build your business. They may not follow you back, but it gives you a good opportunity to join a conversation and get your name out there. Retweet their posts or comment on something they’ve said. They may also post valuable resources for you to check out. People tweet “I’m looking for a web designer” or “I need help finding a good logo designer” frequently. Search often and you’ll be able to capitalize on those opportunities to land a client, or at the very least, spread the word that you’re a working designer and available for hire. Tons of other designers and developers ask questions about coding issues, program quirks, or client dilemmas and will be very grateful for the help you can provide. The next time they need help on a project or have too much work, they will hopefully think of you. Network with other designers by commenting on the designs that they post. People generally love hearing what you think about their design (or else they wouldn’t have posted it on Twitter). This is a good way to connect with other designers and also showcase your own design tastes and expertise to your followers. I love seeing what other designers are doing and enjoy it when designers post their newest projects. However, don’t spam your followers with tons of stuff you’ve done, keep it to one post to announce a new site being published or a new business card you’ve designed. Keep your tweets relevant and not (too) self-promotional, or else, you might find yourself losing many of your followers. Post awesome articles and tutorials that you’ve found. I can’t possibly include every cool web design blog in my RSS reader (it’s already out of control) but I love reading the occasional cool post I see on Twitter from a blog I don’t subscribe to. Sometimes I find an awesome blog that I haven’t even heard of before! Twitter is a great way to trade information and knowledge. Something I don’t utilize nearly enough, but is extremely valuable, is using hashtags to categorize and contextualize your tweets. It allows other people to find you on Twitter: someone clicks on a hashtag on their friends page to find similar content, and they land on your Twitter page. Voila – another connection has been made. 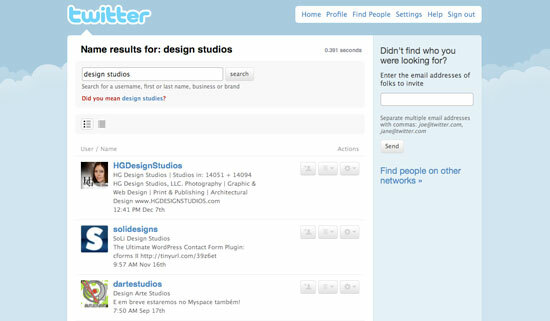 Design groups, design studios, and programmers are people you can find on Twitter. There are also many people near you, but outside of the design world that would be great to network with such as the chamber of commerce in your city or new businesses that need your services. 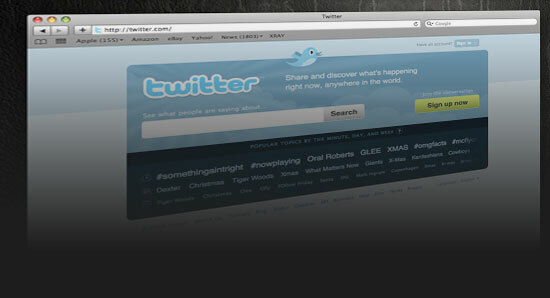 You can use Twitter’s advanced search to find tweeple that live around your area. Create something that matches your blog or website and list the services you offer. 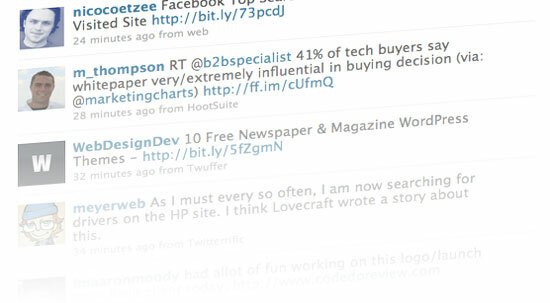 You can use your Twitter background to display links to your other social media profiles. 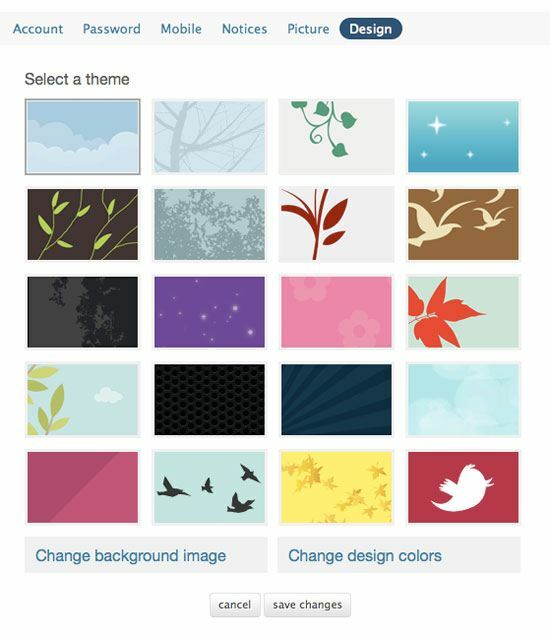 Customizing the look of your page goes a long way in terms of self-branding. Creating relationships is the single most valuable part of Twitter in my opinion. It gives us the opportunity to network and socialize informally while sharing ideas and resources. Join the conversation! Twitter may have started as a way to keep your friends and family updated on what you’re doing but it’s a valuable resource as a working professional these days. Maybe you think that you don’t have time to get involved in another social networking site, but I think you can’t afford to miss out on the opportunities with Twitter. Share some of your best Twitter tips in the comments below.